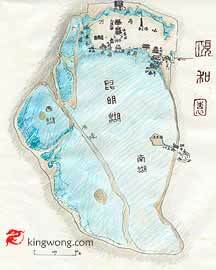 Map of Yiheyuan (Summer Palace). Click picture for large map with place names. 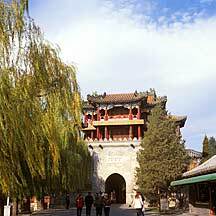 颐和园Yiheyuan is located in the northwest of Beijing city. 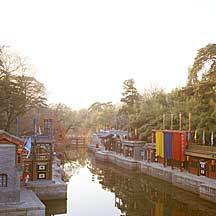 Built in 1153 by the first emperor of the 金朝Jin Dynasty (12th century) who set up his capital in Beijing (then called 燕京Yanjing) after he took control of the northern part of the 宋朝Song empire (960-1279). During the 清朝Qing Dynasty (1644-1911), and especially during 乾隆Qianlong's reign(1736-1795),	the garden was heavily renovated and enlarged. The present garden occupies an area of almost 3 square kilometers, of which	more than three-quarters are lakes. I spent a full day hiking the garden, mostly around the lake. The walk is comfortable, even though	there were the usual incessant crowds of tourists. But since the garden is so large and has many points of interests, they were nicely dispersed. 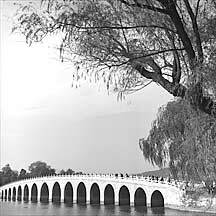 The lake design modeled much after the famous 西湖Xihu (West Lake) of Hangzhou, but beyond the moon-bridges and dykes, nothing else is similiar. 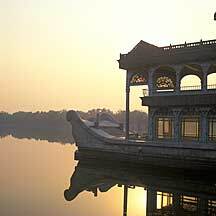 Compare to the leisurely and egalitarian mood of the West Lake, the atmosphere here was stiff and the scenery was hard. 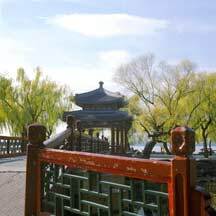 Of course, Beijing is in the north, not far from the craggy mountains and the hard wind; and so the garden cannot escape being northern. Besides all these, there was also the lingering imperial coolness, and a sort of narrowness in its large scale. Everything seems to be too precisely placed. 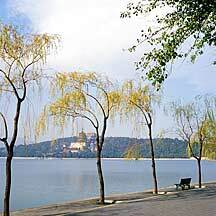 The beauty of the West Lake is in its openness and indifference to things within and without. 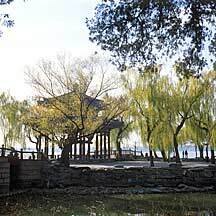 Whenever I walked in the West Lake, I always sense its confidence; Yiheyuan, however, lacks vibrancy. But whatever it lacks, its abundance of details fills in. 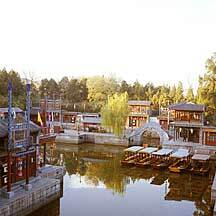 And it enjoys itself today as the largest and most well-preserved royal garden in China. The Long Corridro arching up a building. 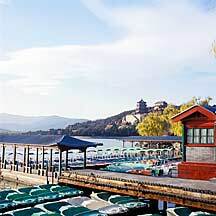 The frozen Kunming Lake at winter. 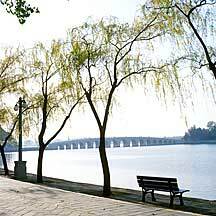 This great stone bridge was built in the fourteenth year of 乾隆Qianlong's reign(1750). It measures 150 meters in length and its height is determined by 17 arches rising incrementally from both ends;where the nineth is the highest,symbolizing the emperor. 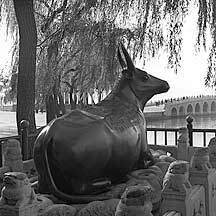 Lined on both sides of the bridge's stone balustrades are 544 stone lions,each are different. 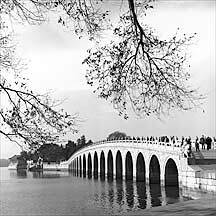 This large stone bridge was built in the fourteenth year of 乾隆Qianlong's reign(1750). 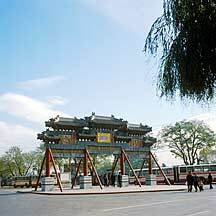 It measures 150 meters in length and its height is determined by 17 arches rising incrementally from both ends;where the nineth is the highest,symbolizing the emperor. 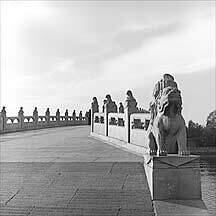 Lined on both sides of the bridge's stone balustrades are 544 stone lions,each are different. A tree lit by the golden sun-setting light. A group of soldiers and tourists admiring the huge rock sculpture before the Renshoudian Temple. Walking on the sidewalk between the Kunming Lake and The Long Corridor. 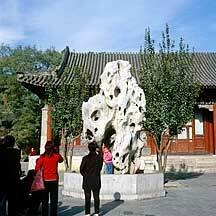 The Renshoudian Temple was built during Emperor 乾隆Qianlong's reign(1736-95) and was named 勤政殿Qinzhengdian Temple. 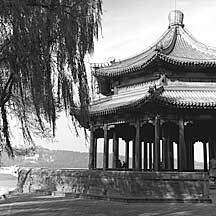 It was renamed later to 仁寿殿Renshoudian Temple after major renovations in 1890,so named in hope that the Empress Dowager 慈禧Cixi may live a long life. The Dowager and the emperor often held court here. A distinctive Chinese archectural element;the rib of a rooftop. A night scene with one of the several islands in the on the lake. Section of the Garden with part of a wall. Walls are a key element of a garden. A well-designed and well-placed wall provides the guests not only a soothing visual massage, but also invites them to participate in the creative process of garden design. By going through the mazes, one "draws" the garden.